DO-26048-99 was succesfully added to your cart. Today’s HVAC technicians need a simple solution for diagnosing differential pressure and airflow ventilation issues. The Fluke 922 makes airflow measurements easy by combining pressure, air flow, and velocity into a single, rugged meter. 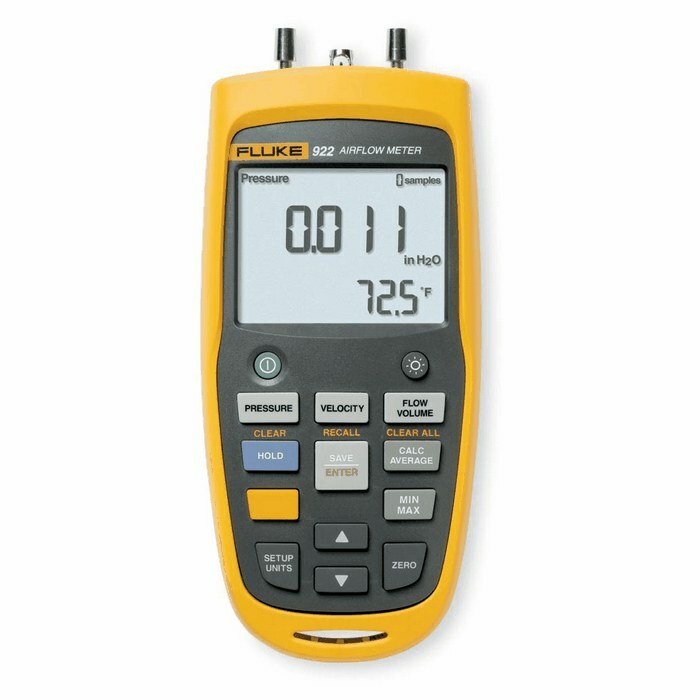 Compatible with most pitot tubes, the Fluke 922 allows technicians to conveniently enter duct shape and dimensions for maximum measurement accuracy. Two rubber hoses, four AA batteries, 1.5 V battery, user’s manual and soft carrying case. Will the 12" pitot tube work if measuring air flow within a 3" or 4" pipe? How sensitive is the readout (how many places right of the decimal point?) does it read in pascals or inches? The pitot probe will work properly in a 3" or 4" pipe provided you correctly enter the pipe size for the velocity to be calculated. The meter can display pressure in Pascals, IW, mmH2O, mbar or PSI; velocity in fpm or meters per second; air volume in cfm or cubic meters per hour; and temperature in degrees C or F. The meter has a 5 digit display yielding a maximum of 4 digits to the right of the decimal place. does this meter update data automaticly. Yes, but it still has functionality to include Min/Max/Average/Hold functions for easy data analysis. The simple, intuitive interface allows you to measure pressure, velocity, or airflow at the push of a button.